GET TO KNOW YOUR BABY’S TOES! Grand Central Footcare Blog GET TO KNOW YOUR BABY’S TOES! Tight shoes are a solid no from podiatrists everywhere. 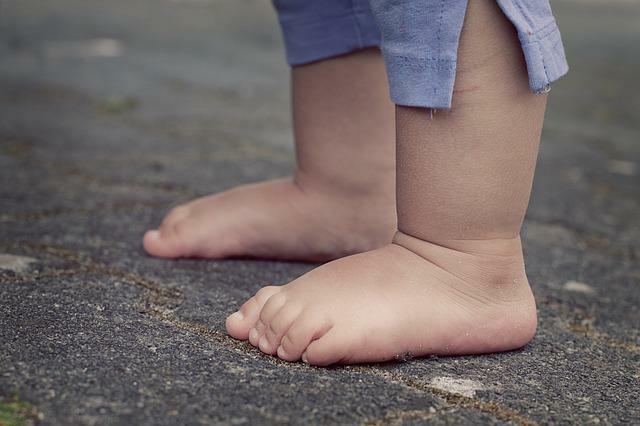 For the same reasons we discourage tight fitting shoes in adults, it’s even more important to ensure that baby feet aren’t restricted to tight shoes. Do you or your spouse have wide feet? This may have been inherited by your child! While our bones are fully developed, theirs are not - this can lead to deformities like bunions, hammertoes, and even flat feet. The solution here is to make sure their shoes are loose fitting until they actually begin to walk and will need more support! Before they can walk, help them mimic the actions involved in walking. This can be done by playing a fun game of bicycle on their backs! Gently guide your babies legs in a cycling motion. Massaging their muscles and softly manipulating their lower limbs will aid in healthy circulation and sensory development. Peep in on those toes daily! Not only are they cute and fun to play with, but taking a daily look at your baby’s toes, toenails, feet, and ankles will help you catch something early on that might seem odd. For example, if you’re helping move your babies legs and toes for exercise and notice that one area of their foot seems particularly sensitive, take note. Always be sure to bring anything worrisome to your baby’s podiatrist and pediatrician’s attention right away! It may seem like a small task, but starting foot problem prevention early on is the best thing you can do for your child. If you’re ever unsure if something is problematic, don’t hesitate to ask! It’s always better to err on the side of caution. Got a question for Dr. Les J. Glubo? Call Grand Central Footcare today at (212) 697-3293 to inquire or to book your next appointment at our Grand Central location in New York City.